Why are there literally no swimming costumes for 0-3 months? They wanna swim too! We bought the 3-6 months costume for Daniel when he was about 2 months old and thought we’d keep it until he could fit it. It was so big on him and we even thought of stuffing it with his swaddles, but we decided it would be cruel to embarrass him in front of girl babies at the pool. Now he finally fits the costume, so yayy off the pool we went. Dean and I were sooooo excited, pacing back and forth in the house thinking if we forgot anything. Did you get the towel? I thought you got the goggles. Wait, I forgot the camera! Did you charge the camera?? There’s no battery. Does Daniel have to wear diapers? What if he poops? All this while, Daniel is just in his little giraffe chair, sucking his thumb while staring at the drama before his eyes i.e. The Mom and Dad show. A few minutes later, we were at the pool, waiting anxiously for Daniel’s reaction as we dipped him into the pool. The camera was eagerly rolling to capture this joyous moment. Well… we were all disappointed. I could tell he loved it because he didn’t cry, but was calm and cool so he didn’t mind the water. He either cries or looks like this -___-. But showing excitement? Nahh that’s not how my son rolls. They say cool and calm babies make confident extroverts when they grow up. High tolerance for constant changes thus the lack of reactions, lol. okay his telinga looks like fadza’s. haha! Baby D is as cool as a cucumber! And he’s cute! OMG! What a cutie pie! Love! V, i suggest you try something like a wetsuit wrap. If the water is chilly, this neoprene wrap which has Velcro helps to keep the body warm. Toys R Us and Mothercare has this. I always apply Vicks or Eucalyptus oil on my kids chest and on the soles of the feet after a swim. Helps keep them warm. Keeps the chills away. 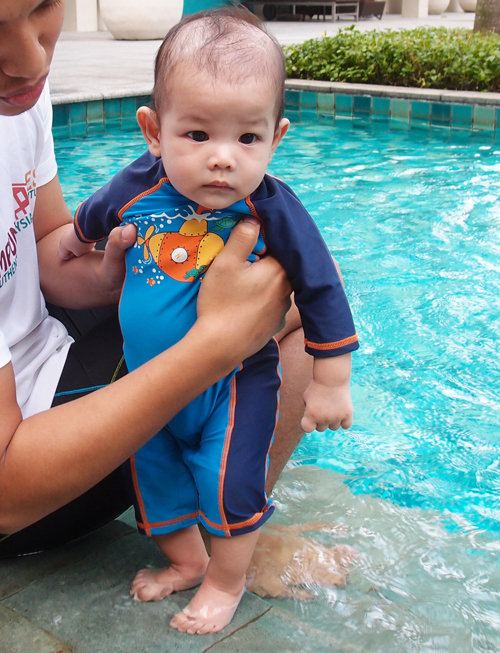 You could buy neck ring for babies, it’s available at toysrus or you can go to swimming suit section, brand: Ogival. Most babies will kick their legs! go try! it/s fun!! awwww baby D is soooo adorable! rasa nak cubit! Vivy, they do sell swimming pampers – “Little Swimmers” from Huggies. Grocers like Village Grocers and Cold Storage carry them. Check them out! happy birthday vivy yusof!!!! you are a role model to many, you’re sooo amazeballs. May Allah grant you another blissful year and many more to come. thankyou for touching our lives with your humor and writing. love you mommy V have an amazing birthday!!!!! Fadza is wearing his Kampung Quest t-shirt 🙂 Happy Birthday again Vivy!